In the mid 80’s the Dutch silver industry was in deep crisis and many production companies had to close the doors. For at lot of silversmiths this meant the end of their job. In spite of the bad prospects some of them continued as a self-employed craftsman. In order to compete with Asian import, the independent silversmiths became entrepreneurs who could translate artistic ideas into objects. 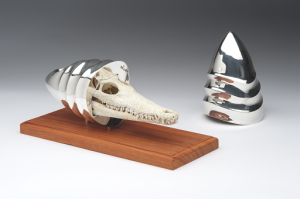 In the 90’s a number of Dutch silversmiths united in Silver in Motion. This was the start of the renaissance of Dutch silver craft. The exhibition Silver Art in the Netherlands shows what has been achieved in the last 25 years. This unique exhibition shows 137 exhibits of contemporary silverware made by 46 artists silversmiths. One of the most impressive exhibit is a set table which consists of 170 pieces of flatware by father and son Thalen and Thalen. On this topic the book Zilverkunst in Nederland will be published (ISBN 9789462620803 / www.uitgeverijdekunst.nl).